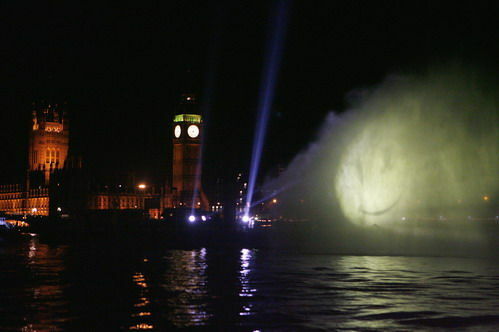 To celebrate the Paramount Pictures UK release of Watchmen, London’s River Thames had a Watchmen spectacle that was bigger than life. 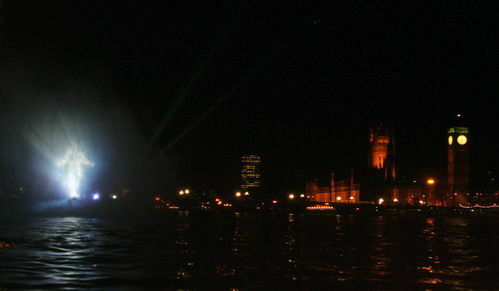 Dr Manhattan, the blue skinned super-powered being rose above the Thames to a height of over 70 feet, towering over all those who attended the event. This dramatic spectacle was created using the world’s biggest water screen projector. The water screen, moored in the middle of the Thames between the London Eye and The Shell Building, created an enormous vertical screen of water that extended 72 feet in height and 100 feet across. Specially created Watchmen footage was projected onto the screen to showcase Dr Manhattan’s translucent and shimmering form in dramatic and gigantic effect. That would have been something to see in person! Watchmen opens tomorrow, March 6 2009.